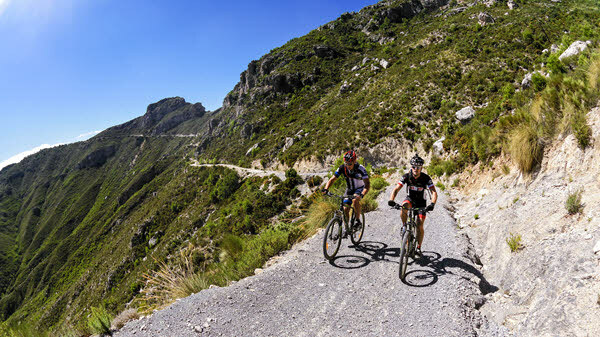 Next Level Cycling organises customised cycling holidays for small groups coming to Costa Tropical to enjoy the challenging quiet roads and spectacular sceneries. We are situated in a small coastal village called La Herradura, in Costa Tropical. This is a hidden gem between Nerja and Almuñécar, just 50 min from Málaga airport. 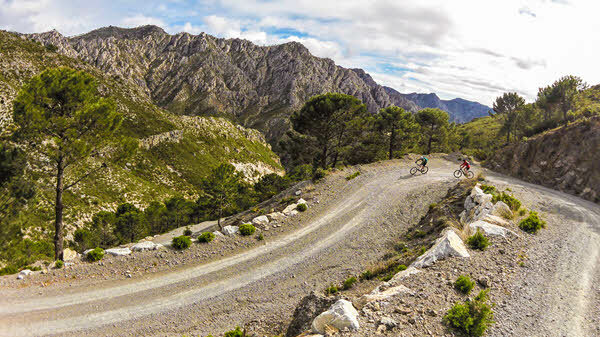 We offer packages including bike rental, accommodation, transport and guided tours for both mountain bike and road bike. 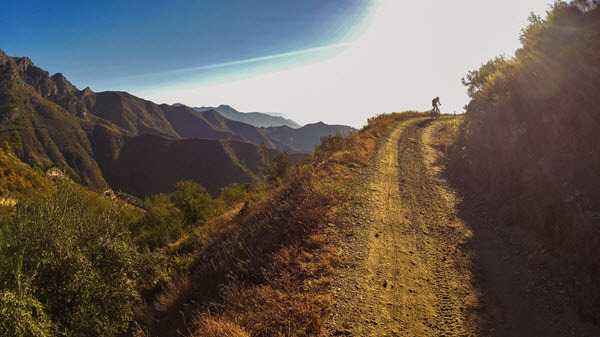 Costa Tropical is very cycling friendly with both plenty of tracks in the mountains perfect for mountain biking and quiet roads for road cycling. Enjoy stunning mountain sceneries and gorgeous fruit valleys from the saddle. Be it spring or autumn or even during the hot summer months or sunny winter days, get out on a bike and go for a ride! 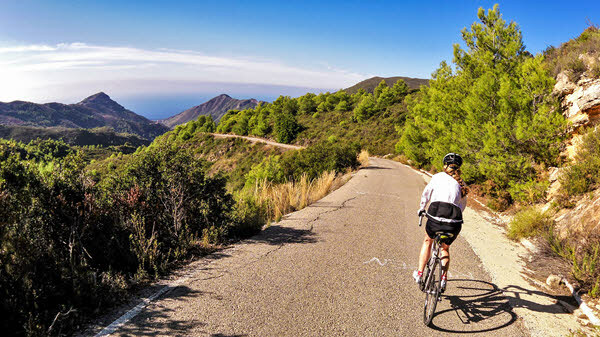 In Costa Tropical there are good conditions for cycling holidays all year round. Next Level Cycling also organizes guided day trips and we rent out both mountain bikes and road bikes. Our guides have lots of local knowledge and a passion for cycling. They are trained and STCW 95 Reg. certified in First Aid and speak English, Spanish, Swedish, Danish and Norwegian. Björn is a cyclist with a passion for the adventure. Seeking new trails and share them with friends has always been a weekend delight. Björn has put in endless hours searching those perfect trails and quiet smooth tarmac roads for you to enjoy. He speaks excellent English, as well as Spanish, Swedish, Danish and Norwegian, and has a lot of knowledge about local cultures, history and the environment. Bjorn is a wonderful guide, able to gauge the skill of a rider and adjust the route, which he did for us. He has a nice mix of quiet, unflappable, steady reliability with perceptive charm and affability. We highly recommend his trips. Björn is a very professional guide and very nice as well ;) Björn will check your skills and make the tour after your skills + add some challenges. Björn was having full control and was communicating in an excellent way the whole trip. A return to you is a must! Bjorn was a really nice and very professional guide. He learned us his skills and showed us the beautiful surroundings of Costa Tropical. Quickly he recognised our interest in fresh foods so he showed us his knowledge of the fruits and flora of the region. Björn is fun to spend time with and a great guide. He adapts the tour to your fitness level and capabilities. The bikes are in very good condition and you get the feeling that Björn has mapped out every square meter to find the best trails and roads. Great cycling with a phenomenal guy who loves cycling. I have cycled twice with Björn and I can really recommend him if you want to have cycling experience out of the normal. Bjorn is very knowledgeable about the area. He tailors the rides to your ability and interests and was excellent company.